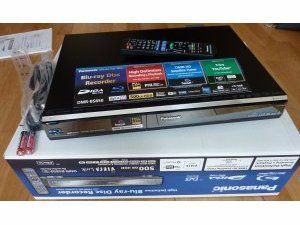 Panasonic's Freesat Blu-ray recorder has been treated to an exclusive hands-on by Home Cinema Choice, with the magazine in awe of the machine. Not only is the deck the first Blu-ray recorder in the UK, it comes with a 500GB hard drive and twin Freesat HD tuners. HCC has called the recorder "a Cadillac of convergence," and are impressed by the machine's BD capabilities, touting it as a "solid home cinema source". Some quibbles have been made by the fact that some content can't be recorded to Blu-ray disc (all of ITV's HD transmissions, for instance) but the ease of recording was praised, with HCC saying it's "a quantum leap in performance" when compared to Panasonic's DVD recorders. In other news, the team have also created a digital magazine. The 2009 Home Cinema Choice Best Buy Awards magazine in association with DTS and category sponsors Domestic & General, is now available online and for free download. This digital mag, created by TechRadar's publishing company Future Publishing, offers a number of cool features, such as flipping pages, zooming, emailing, sharing, and printing. Find out more by pointing your browser to www.homecinemachoice.com.